A Products Section functions as a container for your products. These containers can help you segment and keep your products organized. 3) The new space will be inserted into the presentation, and in the Sections List, its Settings will expand. 4) Drag and drop products into the section to group them together. If you have loose images recently added to the presentation, they may be in the Product Bin at the bottom of the page. 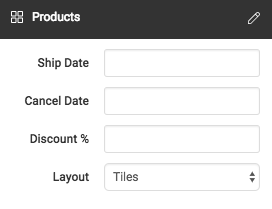 5) In the Settings menu you can apply a Ship Date, Cancel Date, or Discount to all products within the container. You can also change the Product Display Layout (Tiles or Featured). 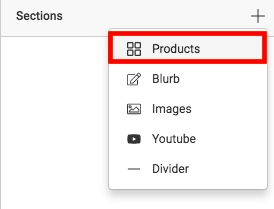 Note: To keep better track of your Product sections, you can click on the pencil icon to rename them and click on the checkbox to save those changes.